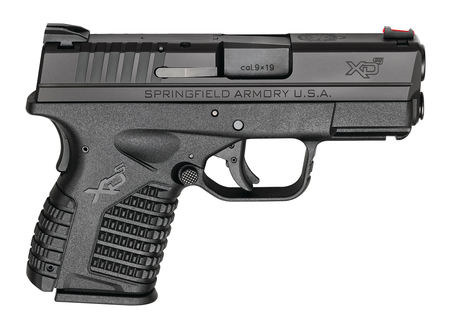 Springfield XDS Essential 9mm 3.3 Inch Barrel Double Action Only USA Trigger System Black Melonite Finish Slide Black Polymer Frame 7 and 8 Round. Double action only (USA Trigger System). Dual spring with full length guide rod. Black polymer frame with enhanced grip texture. Front fiber optic sight, fixed dovetail rear sight. Loaded chamber indicator. Slim single stack frame. Single position picatinny rail. One flush fitting magazine and one Mag X-Tension. Lockable plastic case and cable lock and bore brush.